A collaboration of academic, industry, and government researchers have harnessed genomic sequencing to more precisely identify food pathogens. Their findings appeared online earlier this month in the journal Applied and Environmental Microbiology (paid subscription required). To identify the source of outbreaks of food-borne illnesses, such as salmonella, public health authorities have up to now analyzed the banding patterns of DNA from bacteria samples. 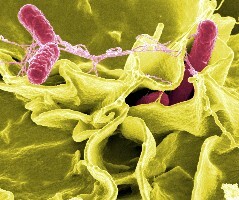 Different strains of bacteria have common DNA fingerprints that are too similar from this method to differentiate between them, however, making it difficult to establish whether salmonella that made one person sick was the same salmonella that infected another person. The researchers led by Cornell University food science professor Martin Wiedmann decided to take a different, more genomic approach. Wiedmann’s team that included participants from Washington State University, the diagnostic instrumentation company Life Technologies Corporation, and New York state and city public health agencies investigated black and red pepper contaminated with salmonella bacteria that covered 272 cases in 44 states during 2009 and 2010. Wiedmann’s team sequenced the genomes of 47 bacteria samples from that outbreak, 20 that had been collected from human sources during the outbreak, and 27 control samples collected from human, food, animal and environmental sources before the outbreak. This process made it possible to quickly discriminate between outbreak and non-outbreak related cases, isolating four samples believed to be connected to the pepper contamination. For example, the team found other genomic links in the 2009-2010 pepper samples. A salmonella strain that led to a nationwide recall of pistachio nuts in 2009 turned up in samples from four people, only one of whom had reported eating pistachios.